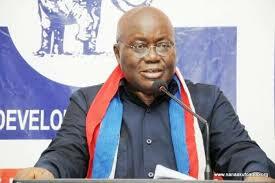 Ghanaian leader Nana Akufo Addo on Monday paid glowing tribute to Ghana’s first President, Osagyefo Dr. Kwame Nkrumah for securing independence for the country from Britain. Delivering his speech at the Black Star Square, President Nana Akufo Addo also paid glowing homage to the nation's fallen heroes such as D.J. Danquah, Akpaloo, and E. T. Mensah, Paa Grant, Obtesebi Lamptey, Akon Adjei, and others, who helped in diverse ways during the independence struggle. According to President Nana Akufo Addo, in 1949, on 12th June, Kwame Nkrumah broke away from the United Gold Coast Convention (UGCC) party and formed his own party, the Convention People’s Party (CPP). In 1957, the British flag was lowered and jettisoned while the name Gold Coast that had been given to us and took on the name, Ghana, the name of our ancestral home. “The name Ghana was meant to give us a fresh start and mark the break from colonialism; and it was also meant to give us a sense of our historical roots,“ he said. The Independence parade was so excellent that participants applauded the security agencies, pupils, students and cultural troops, while the Air Force contingents displayed with their aircraft to the admiration of the spectators. Some African leader, who attended the celebration, included Zimbabwean President Robert Mugabe, President Faure Gnassingbe of Togo, Vice President of Zambia, Inonge Wina and the Vice President of Liberia, Mr. Joseph Boakai. Others are Vice Presidents of The Gambia and Zambia, former Nigerian President Olusegun Obasanjo Ghana’s Jerry John Rawlings, John Agyekum Kufuor and John Dramani Mahama.